The year that I dropped out of school was a very confusing and emotional time. In the beginning, I tried to carry on as though nothing had changed — I kept in touch with my friends, I saw them on weekends, I told them I’d be back in school in a few months — but the months eventually extended into years and communication with friends went from sporadic to non-existent. I became a recluse. I was fourteen years old with absolutely no clue what the future had in store for me. I was spending my days at home, reading books, watching TV, and listening to music, while my friends and classmates were studying, preparing for exams, struggling with IB, and moving closer to high school graduation. There were many times when I felt that I was getting left behind with no way of ever catching up. In the place of an education, I had an exploration. I mentioned in a previous entry that I was desperate to fit in and be a ‘cool kid’ when I moved to my new school. I remember on my very first day there, I walked into my first period science class, and upon joining a group at a table, the very first thing anyone asked me was if I liked The Moffatts. I did like The Moffatts, in fact they were probably my favorite group at the time (not ashamed to admit it now), but I was afraid to say it in case it was considered to be ‘uncool’ which would result in my being shunned as a loser, so I downplayed it and said I thought they were okay. Turns out, the person asking me was a massive fan. There were so many social influences that went into my attitudes and interests that sometimes, I would end up liking things that I didn’t really like and disliking things that I did like just so I would fit in. When I stopped going to school, I didn’t have to worry about that anymore. I formed my own opinions without fear of ridicule. Peer pressure and influence is such a huge part of growing up, especially in the teenage years, and I feel that it can contribute greatly to the person we end up becoming. During my years of isolation, I didn’t have peer pressure — I had my siblings, but I never had to worry about impressing them or fitting in, so I was always just myself, and even if they thought that some of my interests were strange, they still loved and accepted me regardless. I spent a lot of time in my own head, pondering my thoughts, and basically being my own person. I discovered that I liked who I was and didn’t mind if others disagreed with my tastes or opinions because I also understood that everyone is different and there is no such thing as pleasing everyone. Had I stayed in school, I most likely would have gone to university to study business management or marketing because those courses offered more job security and prospects after graduation. It was only after working in marketing and the corporate world when I realised that I didn’t enjoy it and it felt so far from who I really was. Upon realising that, I finally acknowledged what I probably knew all along — that I belonged with books — and that if I ever got the opportunity to go to college, it would be to study literature. It may not generate as much income, unless I end up writing the next bestseller, but at least I would be happy. This isn’t to say that no education is the best education because it definitely does not apply to everyone, but in my case, I think it worked out okay. I feel very comfortable with the person that I’ve become, confident that I’m on the right path now, and will always be a strong advocate of the saying, everything happens for a reason. The value of a formal education, on the other hand, is a different story altogether as discussed in https://theroadtodelta.wordpress.com/2014/07/06/the-quest-for-paper/. I heard about Coursera around two years ago when a course called Fundamentals of Online Education: Planning and Application caught my attention. I was teaching online at the time, had just recently completed CELTA, and was looking for ways to embellish my CV in the absence of a degree in hopes of increasing my chances of getting hired somewhere. So I browsed around the site, familiarised myself with how it worked, what it required, and then I signed up. The great thing about Coursera is that it’s free. All you need is a computer, an Internet connection, and time, though I suppose you would also need to have a penchant for self-study and good time management if you plan on doing the course in its entirety and receiving a statement of accomplishment. The courses are offered by actual universities or organisations around the world and many, if not most, are well-known. Each course will usually have its own unique setup and requirements for completion, but some common features are video lectures, reading assignments, writing assignments, peer grading, peer interaction, and quizzes/exams. If you’re not interested in attaining the statement at the end of the course and are only interested in the resources, then you’re free to follow the content week by week and skip the assignments and quizzes that are worth points required for the statements. I opted to go for the statement for every course that I took so that I could have proof of taking the course and also so that I could have something to add to my portfolio. The workload for each course will vary as will the course length, so you can expect to do as little as two to three hours per week for four weeks, or as much as six to eight hours per week for twelve weeks. There are also deadlines to meet for quizzes, assignments, and grading for those who wish to earn a statement. As someone who has experience with online self-study from my high school program, I know how difficult it can get to just sit down and study when there are so many distractions around, more so for Coursera since it’s free and you don’t really stand to lose anything if you end up not doing the work. But all you really need when it comes to self-study is a goal and motivation to reach it. It’s especially difficult to get motivation when the content you need to get through is possibly putting you to sleep, but I guess if you want something enough, you’ll find it in yourself to do what it takes to get it. As soon as I found myself starting to drift off, I’d stop whatever I was doing, get up and take a break, then go back to it when I was ready to start again. That’s another great thing about Coursera and self-study, you choose when you want to study, so you can do one hour a day for six days or you can cram the six hours into one day if that’s your style, as long as you meet the deadlines. You also have a chance to interact with other people taking the same course from all around the world–thousands of them–and that offers good support if you find yourself struggling with some of the content or if you just want to make some new friends who have similar interests. When I first started with Coursera, most of their courses were in the fields of marketing, math, economics, or science, so I didn’t find much to interest me at the time so I was only enrolled in one course–which, unfortunately, ended up getting cancelled because of a number of difficulties it encountered when it launched, which was actually kind of ironic considering the course topic. After some time though, other fields were getting added like literature, history, and education and that’s when things started getting busy for me. There were times when I was taking three or four courses simultaneously and my entire day just consisted of Coursera. My job was home-based at the time and that’s why I was able to invest all the time and effort into it, but if I had been working a full-time job out of the house, I doubt I would have been able to do what I did. I’ve completed fourteen courses to date, and my next one, Learning to Teach Online from UNSW Australia, starts in a week. This is the phonemic chart. Each symbol corresponds to a particular sound in spoken language and is very helpful when it comes to pronunciation. If you’ve ever used a dictionary, then you have been exposed to these symbols, or something similar to them, to inform you how to pronounce a word correctly. I’ve been using a dictionary since I was really young–we had a pretty massive dictionary at home when I was growing up, probably around a foot tall and half a foot thick, normally found not too far away from the encyclopedias. Unfortunately, I never paid attention to any of the silly symbols, because I probably never knew what they were for, so I was basically pronouncing words like anxiety wrong for a very long time and even fought my English teacher about it in the sixth grade. Embarrassing. Now that I’m an English teacher myself, I need to be intimately familiar with this chart because pronunciation is a pivotal part of speaking English successfully, and these symbols are used in lessons to help learners with their pronunciation. Going into CELTA, I was completely clueless when it came to this chart. Most of the learners that I was teaching during my practice sessions knew more about this chart than I did, and that’s most likely because they spent a lot of time studying it in school–even their grammar knowledge was better than mine, if I’m being honest. Thankfully, CELTA gave a sort of foundation for using the chart and becoming familiar with the symbols, and it was a really big part of language analysis for lesson preparation, especially for lexis. It was a struggle, so when the course was done, I told myself that I would study this chart and become fluent in phonemic script–something that is currently still a work in progress, but I am determined, and one day, I will be able to write any word using these symbols correctly. 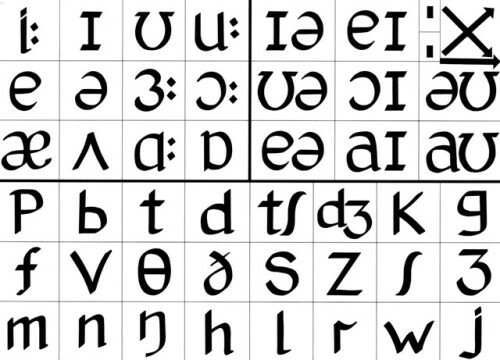 I’ll even write an entire blog post using phonemic script (Just kidding–no, I won’t). If you have any plans of becoming an English language teacher or doing the CELTA, I suggest that you become friends with this chart the soonest chance you get. Next month will mark my third year anniversary for teaching online–unbelievable how quickly time flies. 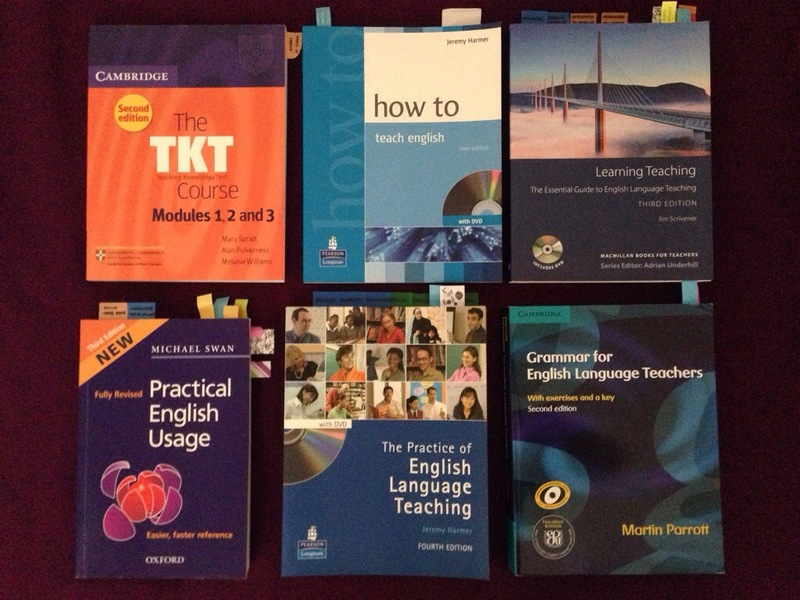 I’ve managed to acquire a mini-library of ELT reference books since then, and they have been invaluable resources not only for CELTA, but also for everyday teaching needs. I never actually took any of the TKT Modules, but my intention with this book was to study the content and do the practice tests inside until I was confident that I could pass without actually taking it. I don’t know if it would be useful for me to do the TKT Modules since I already have CELTA, but it’s something I’ll look into, and if it’s worthwhile, I may just do it. My favorite in the collection is Michael Swan’s Practical English Usage. It’s basically my ELT bible capable of answering any English language questions I have. Highly recommended. This small library of six is already quite an investment on its own (reference books are not cheap), but I’d love to see it grow in the coming years. The first thing I did when I received my university degree was to send out an application to my alma mater, Apollo, in Vietnam. I was fairly confident that I would get accepted, after all, their website stated that they prioritise their graduates, that they prefer applicants who completed CELTA with a Pass B, and that they have a place for newly qualified and experienced teachers alike. Plus, I knew that they didn’t discriminate because I happened to meet a fellow countryman who was working there as a teacher during my training. So I sent it off and waited. And waited. And waited. My confidence sank with each passing day, until I had to accept that I hadn’t made the short list. It’s quite discouraging when my own school won’t hire me and I couldn’t help but think–If they won’t hire me, who will? I’m a big believer of “everything happens for a reason” and this is no different. I couldn’t stay in Vietnam in 2012 because I didn’t have the papers for a work permit, and now, 2014, my job application wasn’t accepted, so I think it’s safe to assume at this point that perhaps Vietnam just isn’t where I’m supposed to be, and that’s perfectly okay. Either way, I get up, dust myself off, and keep going forward. When I chose to pursue ELT as a serious career, I knew that I had three main obstacles to overcome. #1 – Not having a degree. I will never forget what my CELTA tutor said during one of our afternoon sessions when we were talking about careers. He said, “you don’t need a degree to be a good teacher.” That resonated with me so deeply because I felt it was absolutely true and that as long as someone is passionate about something, they will be able to produce results. But as long as it was a requirement in nearly every institution, it would be a roadblock. #2 – Being Asian. In this line of work, being a “native speaker” is kind of an advantage. That means that one comes from an English speaking country such as America, Canada, Britain, or Australia. The Cambridge TKT Glossary defines a native speaker as, “someone who has spoken a particular language since they were a baby, rather than having learnt it as a child or adult.” I consider English to be my first language and I didn’t become fluent in the local language of my country until I was eighteen, and I’m not even really fluent because I’m still pretty useless in it in so many ways, but it’s hard to sell that when I’m Asian with an Asian passport, therefore, not really considered a native speaker. I’m highly irritated when I see job ads that list being a native speaker as a job requirement. Which brings me to a separate afternoon CELTA session when we had a Q&A with the course assessor who said that if an institution refused to hire us because of our nationality, then it is not an institution worth working for and is likely not a reputable institution to begin with–and, of course, I agree with that wholeheartedly. Regardless of the encouragement, though, I still feel like I’m a minority and that I need to work twice as hard to get to where I want to go–and that’s perfectly okay because I don’t mind hard work. It gives more satisfaction once the goal is reached. #3 – Experience. Currently, I have a year and seven month gap since my certification where I haven’t managed to get myself into a classroom, due to #1 on this list. In the last few weeks that I’ve spent job hunting, a lot of ads are looking for experienced teachers. Some of the top schools, my dream employer included, require at least two years post certification classroom experience to qualify for a position. So the challenge now is to get experience without any experience. I don’t enjoy job hunting. I find the entire process to be very stressful, and if one isn’t built strong enough to accept rejections, as there inevitably will be, the stress can be that much more wrenching. I like to think that I’m one of those people who is strong enough, but I’ll admit that I’ve been procrastinating in order to delay the rejection, I suppose. This seems to be my process. I first go through a stage of self-doubt and then slowly give myself a pep talk to build up my confidence that will then give me enough courage to press send. I’m currently at the ‘press send’ stage where I take a leap of faith, keep everything crossed, and hope for the best. If it doesn’t work out, try again. My biggest fear is that I’m trying so hard to break into this profession and when I finally get there, I’ll find out that my first instincts about being a teacher were true and that I’ll end up hating it. On the bright side, I have a job interview tomorrow. Many people are familiar with the phrase that adults tell children – “You can be whatever you want to be.” And so it was that my parents encouraged me to find my passion and follow my dreams. It comes as no surprise, then, that I grew up to become a very ambitious person. As far as academics went, I was doing well in my early years, scoring straight As in school and even getting accelerated. Middle school was a different story having just moved to a new city, into a new school, and suffering from culture shock. My desire for social acceptance meant that my studies had to take a back seat, which they did, and that resulted in the lowest grades I’ve ever received in the history of my formal education. Little did I know that it would also be the last year of my formal education. After completing the eighth grade, life took an unexpected turn and I found myself out of school at the age of thirteen. My first job came along when I was eighteen. After three and a half years of working, life had become a routine, and though I’d felt it many times before, I could no longer suppress the feeling that I didn’t belong there. It was a good job with a decent salary and great perks, but my days began to feel like a chore and I was basically unhappy. However, year after year, I stayed because I knew that nobody else would hire me since I was not a college graduate, let alone a high school graduate, and so in their eyes, it meant that I was automatically not qualified. It saddened me to realise that truth, but at the same time, it gave me the drive that has been fueling me for the last decade. I couldn’t understand why so much value was given to a piece of paper, and why that specific piece of paper had the right to judge one person more qualified than another. It wasn’t so much that I wanted to prove anyone wrong, but more so, I wanted to show that people can be capable of performing a job, excelling in it even, without the formalities. High school came around a year and a half after my resignation. I tried to apply for other jobs, but as expected, was turned down because I was not a college graduate – though one time, I nearly made it past the initial screening stage until the woman interviewing me realised that my middle school was not a university. The job that did hire me, I turned down (refer to post #1 in this blog). I earned my high school diploma piece of paper through an accredited, online, self-study, American school from Pennsylvania. High school opened the door to CELTA and I had incredible expectations from that Cambridge piece of paper. It promised international acceptance and employment opportunities – it was the perfect solution and I was ready to pack my bags and teach my way around the world. Unfortunately, in my excitement and haste, I failed to take into account the requirements for obtaining a work permit to teach abroad – a university degree. So I was back at square one in what seemed to be a very vicious cycle. My goal was DELTA and that required work experience. Experience required a degree. A degree required finances. Finances required a job. Repeat cycle. I was frustrated, to say the least. I found it extremely unfair that I was now a fully qualified English language teacher with no way of getting hired. I felt like I was being punished for not studying enough – something that was out of my control. That’s when Coursera came into the picture. Coursera offers university level courses to the public at absolutely no cost other than time. It started out with one class, a literature course from Brown University, which soon doubled, then tripled, until I found myself enrolled in four classes simultaneously. Suffice it to say that I became very busy keeping up with schedules and deadlines and it was probably as close to being a university student as I could get, except instead of going to campus, I was learning at home, in my pajamas. To date, I have received fourteen Statements of Accomplishment, eleven of them with Distinction. I now had fourteen pieces of paper to add to my portfolio, along with several others I had received from taking other online courses and webinars (seminars that take place online). I was on a mission. It was my hope that taking these courses and webinars would make me more qualified in the absence of a degree. I hoped that it would show dedication and perseverance. I hoped that it would land me a job in a classroom. It did not. What it did do, however, was catch the attention of someone at a local university who happened to be the head of an accreditation program that awarded qualified individuals a college degree based on work, life, and scholastic experience. I went through the application, screening, and assessment processes, I wrote essays, I attended seminars, and I completed all the requirements. And then I crossed my fingers and waited. Two weeks ago, I received that coveted piece of paper and officially became a college graduate. Through all the frustrations and hardships I experienced after dropping out of school, all the waiting and all the wondering, all the hard work that always seemed to be for nothing, I can see in hindsight that everything seems to have happened exactly when they needed to happen. True, it was a slow process, but one thing always led to another, to something better. Journeys are rarely completed alone. I know that I would not have been able to get to where I am today without the help that was given to me along the way. To those who believed in me enough to give me an opportunity to work for them, to those who offered words of encouragement and endless support, to those who kept me sane, happy, and grounded – I thank you, each and every one of you, for being an invaluable part of my journey and my growth. Words are insufficient to properly express my gratitude, but I hope that some day, once I’ve found my place in this world, that I will be able to give something back. For now, however, please accept my heartfelt words and thanks as the journey continues. So I’ve been talking about CELTA and DELTA as though their meanings were as universal as the word ‘bread’ and I realise that it isn’t the case at all. My apologies. CELTA is an acronym that stands for ‘Certificate in English Language Teaching to Adults’ but also means ‘Certificate in Teaching English to Speakers of Other Languages.’ CELTA is an initial teacher qualification, so it’s for people who are just starting out in the field with little or no experience and want to become internationally certified. DELTA is the ‘Diploma’ version, ideally for teachers who have had a bit of experience already. So if CELTA is like the undergraduate degree, DELTA is like the postgraduate degree. To continue from the previous post, I set off to Vietnam in November 2012. I arrived in Ho Chi Minh City two days before the start of the course and I was a mix of nervousness and excitement. There was a pre-course dinner hosted by the school for the candidates and the tutors to meet and get acquainted. The course I attended was a full course, so there were twelve candidates in all, plus the two tutors. There was a long table set up at the restaurant so I was really only able to speak with the people on one end throughout the entire dinner, and I was only able to meet the rest of my colleagues on the first day. Our group was a pretty diverse mix of people and nationalities–there were four Americans, three Australians, four Europeans (Wales, Italy, and the Netherlands), and one Asian (me). On the first day of the course, I made sure not to be late. I was staying in a hotel not far from the school, just a five or ten minute walk away (depending on how fast or slow I chose to walk), so it was really convenient. We started with orientation and being there, sitting in the classroom, felt like being back at school again, which was something I hadn’t done in eleven years–it was a good feeling. The entire course basically has the same schedule throughout, so it’s very easy to keep up with. Monday to Friday, 9:00am to 5:00pm, teaching practice in the morning followed by feedback and assisted lesson planning, lunch, then training and lectures in the afternoon. Evenings are normally spent doing course work–if not planning for a lesson, then working on an assignment. I usually had enough time during the weekends to go around the city to do some sightseeing and explore Saigon a little bit during the day, but my evenings were normally dedicated to course work. Food was never really a problem since the sidewalks were lined with restaurants offering local cuisine, and there was also a market and grocery nearby, plus a refrigerator in my room, so going hungry was not a concern. In terms of workload, candidates can expect to be pretty busy. There’s always something to work on every day since there are a total of four assignments and nine teaching practice sessions over the four weeks. I never had to teach on two consecutive days, with the exception of TP1 and TP2, but the rest were usually one or two days apart, if not more. My study habits is a strange combination of procrastination and perfectionism, so I spent the time in between teaching doing a little bit of both. At the end of the day, I would be in the library doing research or preparing materials for lessons, then an hour later, I’d be watching television or checking Facebook. There were days when I would spend more time planning a lesson than the actual duration of the lesson itself (perfectionism), and there were also days when I would spend an entire Saturday not doing anything related to CELTA, or the very minimum amount, at least (procrastination). Overall, I really enjoyed my CELTA experience. It was challenging, but manageable and the tutors and my colleagues were wonderful. On the last day of the course, our tutor told us something along the lines about how other groups would have some kind of drama or other and that it wasn’t unheard of for someone to end up in tears, but our group was different–we got along well and jokes were being made pretty often, so we were more laid back and I think that probably contributed a lot to everyone’s success. The course ended on December 14th and my flight out of Vietnam was on December 15th. It was a red-eye flight, so I actually had to go to the airport a few hours after the end of the course. We had a sort of farewell dinner and I think that everyone was quite happy to be able to relax after an intensive four weeks. A few weeks after the end of the course, I got the official report from Apollo with my provisional grade, and another few weeks after that, I got the official CELTA certificate from Cambridge with my final grade–a Pass B.